An organization represents a real enterprise, business, firm, company or another organization, to which users belong. In OroCRM Community Edition, only one organization is available in the system, and you cannot create more. 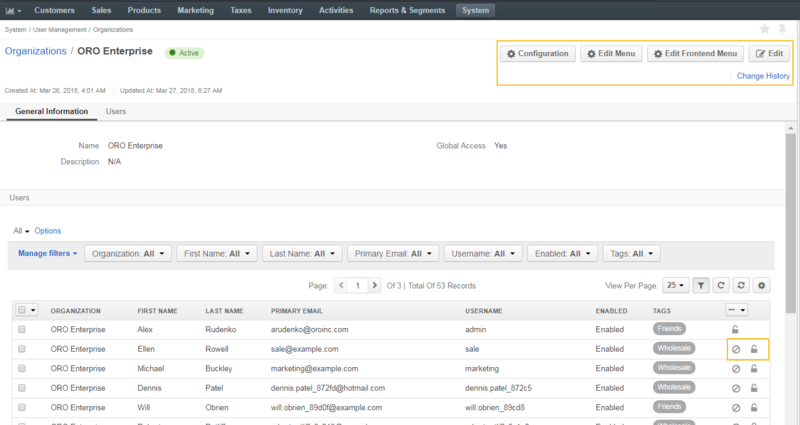 In OroCRM Enterprise edition, you can create as many organizations as necessary. Click Create Organization on the top right. Status — The current status of the organization (active or inactive). Name — The name used to refer to the organization on the interface. Description — Short description of the organization record. In the Users section, select the Has Group check box next to the required users to add them to the organization you are creating. In the Additional section, specify whether the organization has global access level. Only one organization with global access can exist in the system. When the organization with global access already exists in the system, the Global Access field is disabled. More information on managing multiple organizations is available in the Multiple Organization Support topic. Once saved, the organization is available on the list of all organizations under System > User Management > Organizations, where you can filter them by name, edit organizations, and access configuration settings. From the page of the selected organization, you can edit its menu(s), access organization configuration settings, update the details for the selected organization, as well as manage its users. In OroCommerce, you can also edit the frontend menu for required organizations. Click the organization to open its details. To open organization configuration settings, click Configuration on the top right. To edit the management console menu for this organization, click Edit Menu on the top right. To edit the storefront menu for this organization in OroCommerce, click Edit Frontend Menu. To update organization details, such as it name or access level, click Edit. To view who updated organization details, click the Change History link. To disable users within the organization, click in the table at the end of the row of the selected user. To reset the existing password for a particular user on the list, click in the table at the end of the row.